 NEW Ponderables. An Illustrated History of Civilization From Ancient Craft & Modern Tech. NEW Ponderables. An Illustrated History of Civilization From Ancient Craft & Modern Tech. Over 350,000 copies sold worldwide of Ponderables Series – 7th book in the series is here! Great gifts for any inquisitive mind on your list. From the first boat to the first megaliths and ziggurat, the arch and an icehouse… the thoughts and deeds of great achievers always make great stories. Each story relates a ponderable, a weighty problem that became an invention and changed our homes, our cities, our farms, and our lives. 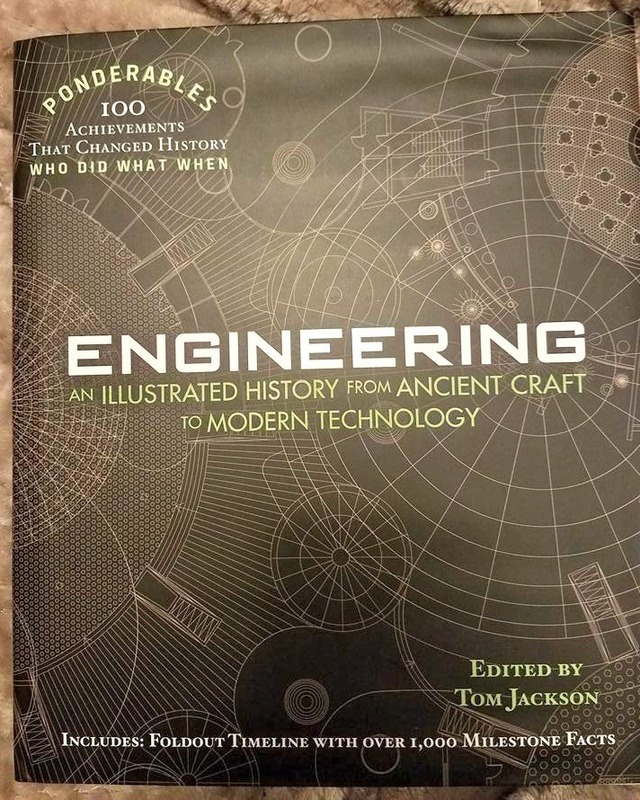 Combining engaging text with captivating images and helpful diagrams, renowned science writer Tom Jackson guides readers through time in ENGINEERING: An Illustrated History from Ancient Craft to Modern Technology (Shelter Harbor Press, October 25, 2016), the seventh book in this highly successful Ponderables™ series. The history of engineering is also the history of civilization. From aerospace, marine and computer applications to genetic, electrical, and robotics, engineering shapes our world and influences just about everything we see and do. Every civilization developed new technology, a particular set of tools, machines, and construction techniques. And each civilization—the Babylonians, ancient Egyptians, the Incas, and the Romans—all rose and fell thanks to their technology. In 1698, Thomas Savery builds The Miner’s Friend; or, An Engine to Raise Water by Fire. It is a water pump that uses steam power. Although incredibly inefficient it is the first functioning steam engine. In 1783, Joseph-Michael and Jacques-Ètienne Montgolfier build the first flying machine capable of carrying human passengers. It is a 30-feet wide hot air balloon, powered by an open fire and made of paper! In 1855, Henry Bessemer designs a new system for making steel, a strong alloy of iron and carbon. Before this invention it took 12 hours to make 1.5 tons of wrought iron. Bessemer’s converter could produce 15 tons of much stronger steel in just 20 minutes. The first communication satellite is Echo 1, a metallic balloon launched into the upper atmosphere by NASA in 1960. In 2007, 3.3 billion cubic feet (94 million cubic m) of sand and rock are laid down along the coast of Dubai to make Palm Jumeirah, the world’s largest artificial ocean island. In 2016, Solar Impulse flies more than half way around the world powered only by electricity generated by solar panels on its wings. 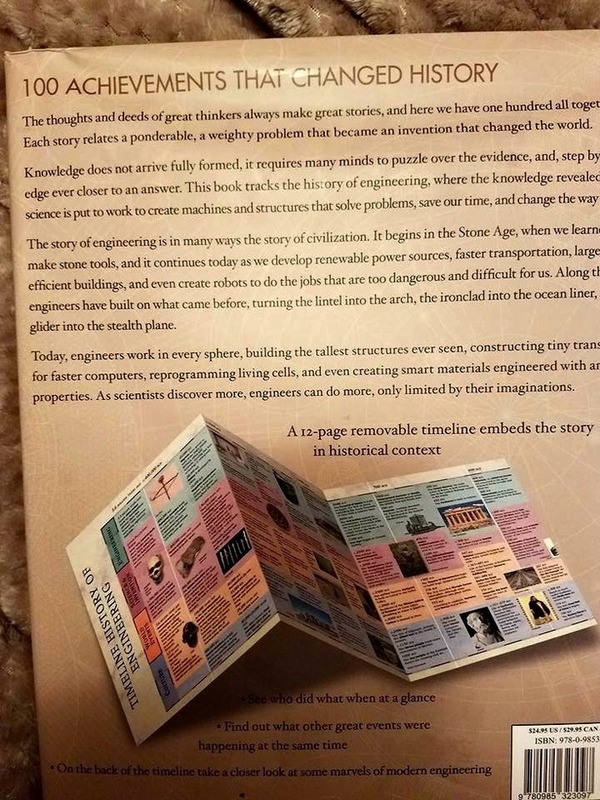 ENGINEERING is an authoritative reference book and timeline that examines everything from from the crudely knapped hand axes of our human ancestor Homo Habilis to the mind-blowing ways in which modern engineering has improved our quality of daily life and expanded the scope of our civilization. The story of engineering is the story of humankind itself. ENGINEERING’s 100 enlightening articles explore the biggest names, grandest achievements and greatest inventions of the engineering world from prehistory all the way up to present day. Carefully curated, beautifully illustrated and addictively fun, this volume is your ultimate guide to the dreamers, thinkers, tinkerers and builders that make our world. ENGINEERING includes a 24-page removable fold-out concertina neatly housed at the back of the book: a 12-page Timeline History of Engineering on one-side and 12 pages of Engineering Marvelsthat demonstrate what happens when construction and engineering meet great design and innovation—on the other side innovation—on the other side. Tom Jackson is a science author based in the United Kingdom. Tom specializes in recasting science and technology into lively historical narratives. After almost 20 years of writing, Tom has uncovered a wealth of stories that help create new ways to enjoy learning about science. He studied at the University of Bristol, and still lives in that city with his wife and three children.